"Speed Racer, slow down!" 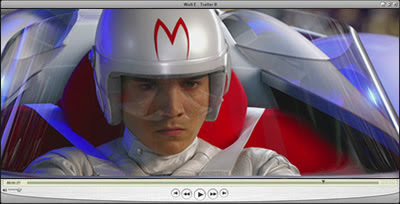 ...thus ends this latest trailer for the upcoming SPEED RACER remake. Many of you know of my general disdain for what the teaser trailer presented to us - essentially a non-interactive video game, but this latest trailer provides the tiniest bit of hope that there might be something positive to take away from the whole thing. What exactly? I'm not sure yet...perhaps its because I heard the classic "chonk chonk chonk chonk" sound effect or got a glimpse of what looks like the Mammoth car (from the classic animated series)...or because Matthew Fox's Racer X impression is pretty freakin' good. Something caused my hate to go into remission for a moment. Don't get me wrong...I still hate most of the casting choices. Other than Racer X and Speed, none of these actors feel right to me, especially Christina Ricci (that's just a gawd-awful choice). Those of you who grew up with the original cartoon probably feel similarly. In terms of the music...yes...lots of hyper-tempo, electronica stuff, but there is also an interesting, heroic, little fanfare about 1/3 of the way into the trailer. Haven't identified it yet, so if you know what it is, feel free to post a comment.